Craic in Korea: Malaysia: Part 1. 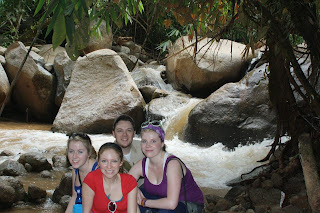 Our arrival in Malaysia via the night-train from Singapore began with panic as I woke at a strange station at 6.45am. We had been due to arrive in Kuala Lumpar at 6.30am and our alarm had never gone off to wake us. I leapt out of the bed woke Dee and we grabbed our belongings as quick as we could racing for the door of the train convinced we had slept through our stop. I asked the guy at the door had we passed KL and he said "yes, 10 minutes", with this confirmation we jumped off the train onto the platform and looked around lost wondering what our next move should be. Just as the train was due to pull off our ticket collector from earlier in the night spotted us and asked "Kuala Lumpar" we said yes and he said next stop so we even more urgency we jumped back on the train just in time. An exciting start to our Malaysian adventure but a lucky one so we took it as a good sign and it was. Next morning Kyle and Vanessa pulled us out of bed to catch the 10.30am bus to the Cameron Highlands (Malaysia's rainforest area) but in typical asian style the 10.30am bus was just not running that day (for no reason) and so we were stuck waiting until the 1.00pm bus. The drive was amazing curling our way up and deeper in the Malaysian forest covered Highlands. Arriving we checked into our hostel and signed ourselves up for the 8hour rainforest trek tour next day. After which we ate and had an early night for our 8am start. The tour began by our guide having to tow the other 4x4 out of a dike it had slipped into but thankfully no one in that jeep was seriously hurt and that was the only misfortune of the day. We began by arriving at the rainforest and trekking uphill through muddy ground. I was panting and thinking to myself why did I agree to this but the ground levelled out soon enough and my regrets vanished. All around bamboo trees and vines surrounded us. We walked fast and then suddenly our guide stopped. We had reached the plot of the Raffesia flower, the world's largest flower (which is apparently technically a fungi). This huge red carniverous plant sat at the base of a tree and we all lined for our chance at a photo beside it. The Raffesia takes 2years to grow and only blooms for 7 days. Around the flower were "bulbs" of baby plants not yet mature. If one of those baby plants are cut all of the Raffesia in that plot will die which is why the number of Raffesia plots has declined in recent years. 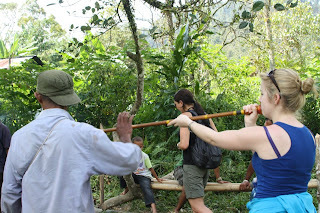 Following this we walked on to a waterfall and then we were brought to an indigenous tribe village. Where they gave us a blow dart demonstration. The people hunt using poison darts supposedly strong enough to kill an elephant in ten minutes. They also showed us the monkey they were fattening up to eat in a few months. Next stop on our tour was the BOH tea plantation owned by a scottish family and here we saw the tea fields and a tour of the factory and then the tea museum. It was amazing to sea the process that goes into our cups of tea every day. According to the workers there my auntie Eleanor (who uses tea leaves not tea bags) is the smart one because they said tea leaves are the best way to make tea. 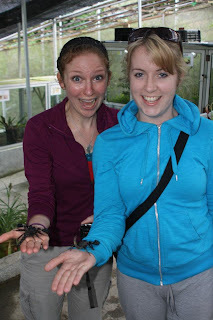 The insect farm was next and it was my favourite stop on the tour. We weren't looking forward to it at first but it was excellent. After walking around and just looking at the various creatures in cases and cages around we thought we would leave but then the guide started opening the cases and taking out huge insects for us to hold. The first was a rhinoceros beetle (like Ringo in Korea) but bigger and he was huge. 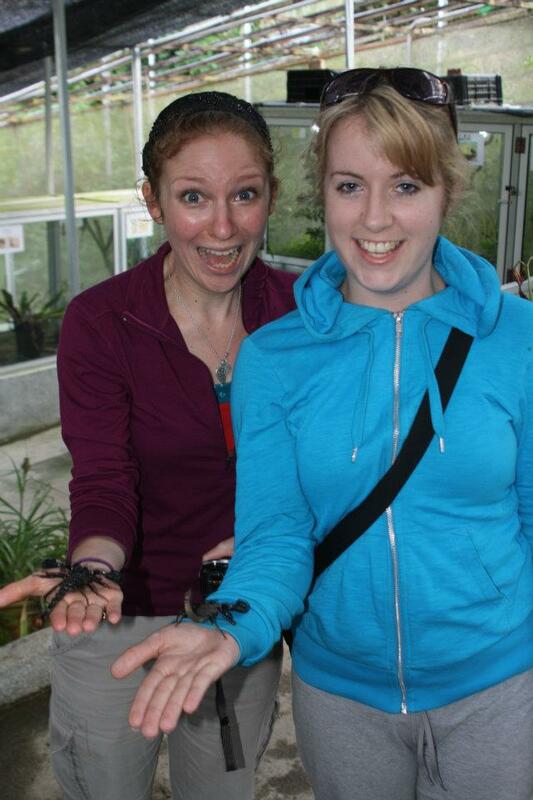 Then we held leaf insects and praying mantis etc. Last but not least a scorpion. Yep, I'm not joking. A live scorpion with his stinger still attached. Only about 4 of us on the tous actually held the scorpions after them assuring us the hospital was nearby if worse came to worse. I was scared but so happy I did it. The final stop was the strawberry farm which was lovely but didn't live up to the stop just before it. We went to bed early that night for our bus at 7am next morning to Langkawi.